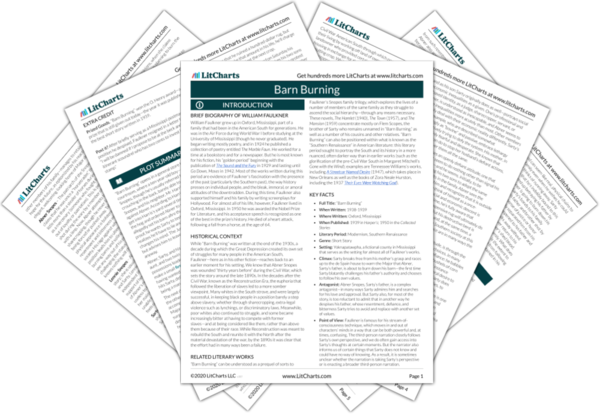 Instant downloads of all 946 LitChart PDFs (including Barn Burning). 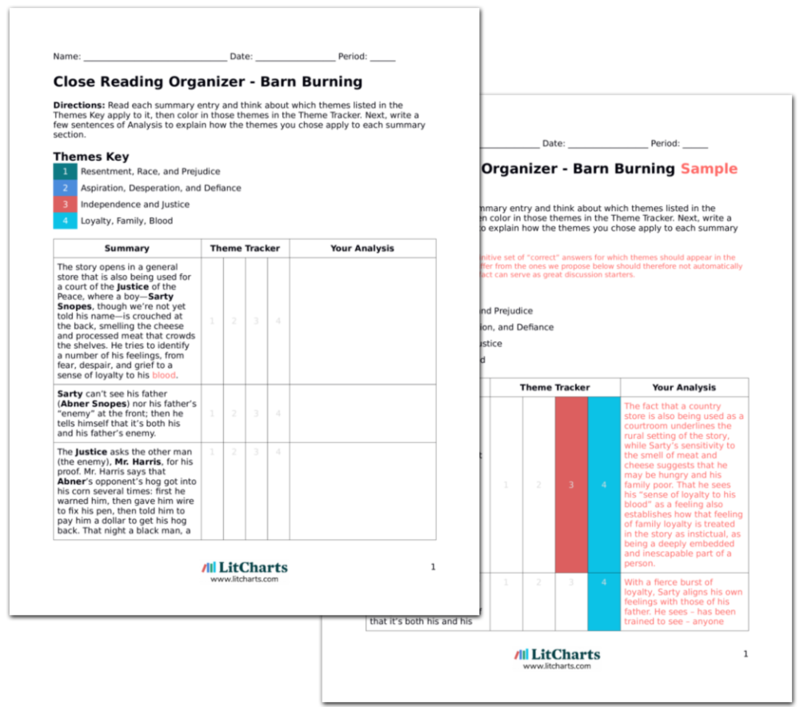 Welcome to the LitCharts study guide on William Faulkner's Barn Burning. Created by the original team behind SparkNotes, LitCharts are the world's best literature guides. A concise biography of William Faulkner plus historical and literary context for Barn Burning. A quick-reference summary: Barn Burning on a single page. In-depth summary and analysis of every of Barn Burning. Visual theme-tracking, too. Explanations, analysis, and visualizations of Barn Burning's themes. Barn Burning's important quotes, sortable by theme, character, or . Description, analysis, and timelines for Barn Burning's characters. Explanations of Barn Burning's symbols, and tracking of where they appear. An interactive data visualization of Barn Burning's plot and themes. William Faulkner grew up in Oxford, Mississippi, part of a family that had been in the American South for generations. He was in the Air Force during World War I before studying at the University of Mississippi (though he never graduated). He began writing mostly poetry, and in 1924 he published a collection of poetry entitled The Marble Faun. He worked for a time at a bookstore and for a newspaper. But he is most known for his fiction, his “golden period” beginning with the publication of The Sound and the Fury in 1929 and lasting until Go Down, Moses in 1942. Most of the works written during this period are evidence of Faulkner’s fascination with the presence of the past (particularly the Southern past), the way history presses on individual people, and the bleak, immoral, or amoral attitudes of the downtrodden. During this time, Faulkner also supported himself and his family by writing screenplays for Hollywood. For almost all of his life, however, Faulkner lived in Oxford, Mississippi. In 1950 he was awarded the Nobel Prize for Literature, and his acceptance speech is recognized as one of the best in the prize’s history. He died of a heart attack, following a fall from a horse, at the age of 64. 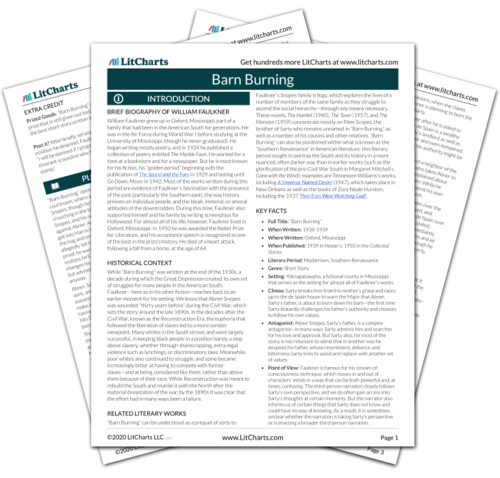 Get the entire Barn Burning LitChart as a printable PDF. While “Barn Burning” was written at the end of the 1930s, a decade during which the Great Depression created its own set of struggles for many people in the American South, Faulkner—here as in his other fiction—reaches back to an earlier moment for his setting. We know that Abner Snopes was wounded “thirty years before” during the Civil War, which sets the story around the late 1890s. In the decades after the Civil War, known as the Reconstruction Era, the euphoria that followed the liberation of slaves led to a more somber viewpoint. Many whites in the South strove, and were largely successful, in keeping black people in a position barely a step above slavery, whether through sharecropping, extra-legal violence such as lynchings, or discriminatory laws. Meanwhile, poor whites also continued to struggle, and some became increasingly bitter at having to compete with former slaves—and at being considered like them, rather than above them because of their race. While Reconstruction was meant to rebuild the South and reunite it with the North after the material devastation of the war, by the 1890s it was clear that the effort had in many ways been a failure. “Barn Burning” can be understood as a prequel of sorts to Faulkner’s Snopes family trilogy, which explores the lives of a number of members of the same family as they struggle to ascend the social hierarchy—through any means necessary. These novels, The Hamlet (1940), The Town (1957), and The Mansion (1959) concentrate mostly on Flem Scopes, the brother of Sarty who remains unnamed in “Barn Burning,” as well as a number of his cousins and other relatives. “Barn Burning” can also be positioned within what is known as the “Southern Renaissance” in American literature: this literary period sought to portray the South and its history in a more nuanced, often darker way than in earlier works (such as the glorification of the pre-Civil War South in Margaret Mitchell’s Gone with the Wind); examples are Tennessee Williams’s works, including A Streetcar Named Desire (1947), which takes place in New Orleans as well as the books of Zora Neale Hurston, including the 1937 Their Eyes Were Watching God). Setting: Yoknapatawpha, a fictional county in Mississippi that serves as the setting for almost all of Faulkner’s works. Climax: Sarty breaks free from his mother’s grasp and races up to the de Spain house to warn the Major that Abner, Sarty’s father, is about to burn down his barn—the first time Sarty blatantly challenges his father’s authority and chooses to follow his own values. Antagonist: Abner Snopes, Sarty’s father, is a complex antagonist—in many ways Sarty admires him and searches for his love and approval. But Sarty also, for most of the story, is too reluctant to admit that in another way he despises his father, whose resentment, defiance, and bitterness Sarty tries to avoid and replace with another set of values. Point of View: Faulkner is famous for his stream-of-consciousness technique, which moves in and out of characters’ minds in a way that can be both powerful and, at times, confusing. The third-person narration closely follows Sarty’s own perspective, and we do often gain access into Sarty’s thoughts at certain moments. But the narrator also informs us of certain things that Sarty does not know and could have no way of knowing. As a result, it is sometimes unclear whether the narration is taking Sarty’s perspective or is enacting a broader third-person narration. Prized Goods. “Barn Burning” won the O. Henry award—a prize that is still given out today—the year it was published, for the best short story written in 1939. Baena, Victoria. "Barn Burning." LitCharts. LitCharts LLC, 12 Jan 2017. Web. 24 Apr 2019. Baena, Victoria. "Barn Burning." LitCharts LLC, January 12, 2017. Retrieved April 24, 2019. https://www.litcharts.com/lit/barn-burning.